“It has become clear that understanding plagiarism is more complex than a simple assessment of originality.” This alert introduces a new study that defines ten possible plagiarism forms. Also identified: the most common and most serious among the group. Study sponsor iThenticate is a leading provider of plagiarism software to academic publishers. iThenticate’s tracking of plagiarism incidence shows that since 2009, the number of submitted documents has doubled since 2009. The number of matched content (10M+ matches identified between 2011 and 2012) continues to climb correspondingly. Data regarding the ten most prevalent plagiarism forms is based on a respondent pool of 334 research scientists from 50 different countries. The majority of respondents were in the science, engineering or medical fields. Most came from North America, India/Pakistan, the Middle East, and Europe. Replication: Submitting a paper to multiple publications in an attempt to get it published more than once. Duplication: Re-using work from one’s own previous studies and papers without attribution. Secondary source: Using a secondary source, but only citing the primary sources contained within the secondary one. Misleading attribution: Removing an author’s name, despite significant contributions; an inaccurate or insufficient list of authors who contributed to a manuscript. Invalid source: Referencing either an incorrect or nonexistent source. Paraphrasing: Taking the words of another and using them alongside original text without attribution. Repetitive research: Repeating data or text from a similar study with a similar methodology in a new study without proper attribution. Unethical collaboration: Accidental or intentional use of each other’s work without proper attribution; when people who are working together violate a code of conduct. Verbatim: Copying of another’s words and works without providing proper attribution, indentation or quotation marks. Complete: Taking a manuscript from another researcher and resubmitting it under one’s own name. 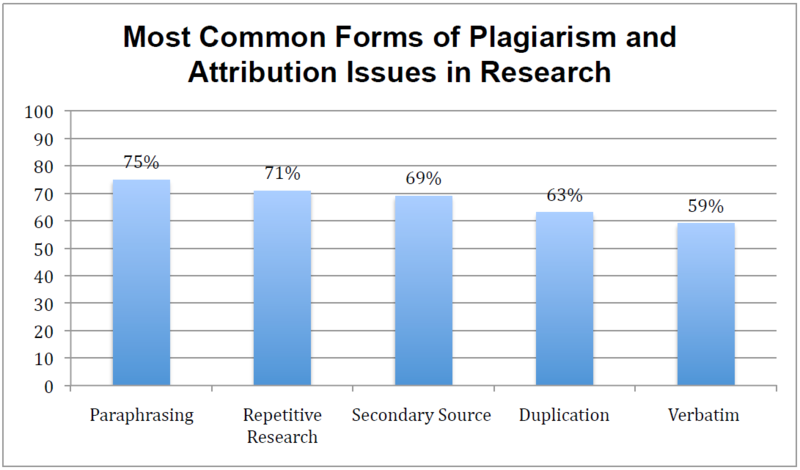 The type of plagiarism deemed most serious – complete plagiarism – was perceived as the least common. Other forms that led the survey in seriousness – namely verbatim plagiarism and unethical collaboration – were perceived to be far more common. For more detailed evaluation of most serious and most common plagiarism forms, refer to the two accompanying tables.